Round-trip international airfare from New York JFK Airport to Kenya. Comfortable and roomy safari vehicles. First-class hotel accommodations in Nairobi. Tented camp accommodations at the first-class Serena Sweetwaters camp. Daily Breakfast, most lunches & dinners. Farewell dinner at the world famous Carnivore Restaurant. Panoramic city tour of Nairobi, including shopping opportunities to purchase Kenyan fabric. Hands on Arts & Crafts workshops with master instructors. Six safari game drives to see the wild animals. An optional visit to David Sheldrick Elephant Orphanage. A tour of the Karen Blixen Museum from “Out of Africa” fame. 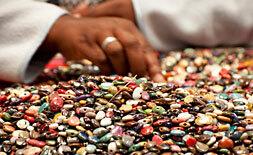 A tour of the Kazuri Bead Factory. A visit to world famous Giraffe Center. 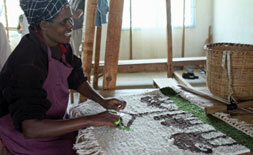 A special tour at the Nanyuki Spinners and Weavers facility. A visit to the chimpanzee sanctuary. A special photography workshop with Jim West. An optional “bush dinner” with Masai dancers. All taxes are included and insurance is highly recommended. 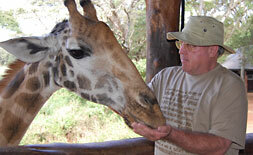 The Giraffe center was set up by Leslie Melville to protect the endangered Rothschild giraffe. Here you will get to meet these amazing creatures face to face. Karen Blixen Museum was once the centerpiece of a farm at the foot of the Ngong Hills owned by Danish Author Karen and her Swedish Husband, Baron Bror von Blixen Fincke. 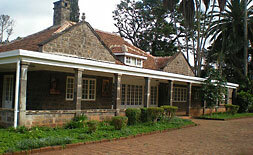 Located 10km from the city center, the Museum belongs to a different time period in the history of Kenya. The farm house gained international fame with the release of the movie "Out of Africa", an Oscar winning film based on Karen's an autobiography by the same title. Kazuri are beautiful, one-of-a-kind clay beads that are hand-made by women in Kenya. These gorgeous beads are used to make the most amazing bracelets, necklaces and earrings. The women who make these gems are paid fair wages and enjoy good working conditions. Kazuri, which means "small and beautiful" in Swahili, began in 1975 as a tiny workshop experimenting with making ceramic beads made by hand. In 1977, The Presbyterian church of East Africa introduced a pilot project to train women from Nanyuki area in the craft of Spinning and weaving. Now, a nucleus of women are practicing their craft on full time basis. Nanyuki is one of Kenya's major centers for wool production. The Kenya highland wool is extremely favourable for hand spinning of natural yarns. 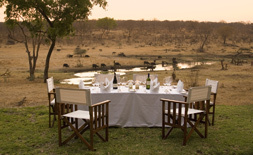 For those who have dreamed of dining in the wilds of the Masai Mara, Bush Dining experiences are incomparable. You will dine while watching the local wildlife in their natural habitat. This experience is presented with tables, safari chairs, and a bush kitchen, where a broad range of meats, poultry, fish and vegetables are cooked on-site. Cost of this optional evening dinner is only $64 per person. The David Sheldrick Wildlife Trust is a Kenyan wildlife conservation charity founded in 1977 in memory of David Sheldrick by his widow Daphne Sheldrick. It assists and advises the Kenya Wildlife Service and manages an orphanage for elephants and rhinos. 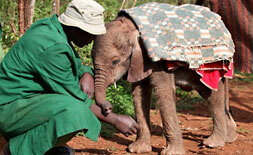 This trust is reintegrating orphaned elephants back into the Kenyan wildlife. Cost of this optional tour is only $32 per person.